Why can't I run Microsoft Dynamics GP via ODBC over a WAN? Updated: Based on a reader comment about a local drive connection not being required for copying and pasting text, I have updated this post. I previously was able to resolve text copy and paste issues by adding a local drive connection, but apparently that should not be required. Sometimes I have been able to restore text copy and paste by reconnecting to the RDP session, but many times that doesn't work. 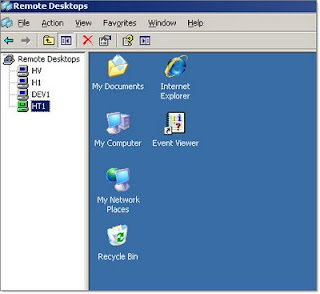 I've mentioned previously that I use Remote Desktop a lot to access many different Dynamics GP servers and environments. I tried the Remote Desktops add-on, but for technical reasons I didn't end up using it, so I currently have 21 rdp files saved to my desktop to access my virtual servers and client servers. For most of the RDP connections to my virtual servers, I choose to have them run full screen on my second monitor. I like to be able to use ALT+Tab and not have to memorize the RDP equivalent keyboard shortcuts for the non-full screen windows. Well, I'll bet you all thought I had dropped off the face of the earth. Not true! Fortunately, business has slowed a little and I'll be able to devote a bit more time to writing stuff. Every once in a while, I stumble across some feature, option, utility, or application that simultaneously makes me say "Wow! That's amazing! ", and "D'oh! I should have known about that!". These are great features / options / utilities / apps that are no secret, but aren't necessarily well publicized. I received an e-mail at 9:30pm this Saturday evening from a client who suddenly started getting errors from a GP related SQL Server job. We started a GoToMeeting session to look at the SQL Server issue, and as soon as I saw his desktop I noticed something out of the ordinary. He said "We're looking at Server A now, but if you want to look at Server B, just click it in the list on the left." Never having seen this before, I asked him if this was some type of 3rd party server management app that he uses--perhaps like a VNC or Citrix management console of some kind, something I have seen at other clients. "No, it's just part of the Server 2003 Admin Pack." Sure enough, this is a fantastic utility included in the free Windows Server 2003 Administration Tools Pack. The tools pack includes several tools, but the one I was most interested in is the "Remote Desktops" MMC snap-in. We are very excited to announce the release of a Windows hotfix that will fix the issues Microsoft Dynamics GP has with the TS RemoteApp feature in Windows Server 2008 and Windows Server 2008 R2. Since the Windows hotfix fixes the issue, we did not release any fix in a GP hotfix.